As a logical conclusion to the fast development an expansion of memories in the last decade, they have pushed upfront as an alternative for storing data, especially in mobile devices. USB flash devices are used with the same purpose as CD or DVD, to backup, store and transport data. Most of the modern memories for storing data is based on same or similar principle. Technology that makes these devices function is relatively simple – from the hardware side. Memory chip is paired with a controller. These two elements are practically the whole of the device, that is the memory. Interface is USB connector, and all of that is on a small pcb. Memory chip is, in almost all types of memory cards, USB flash drives, as well as most of digital devices, based on NAND technology. USB flashes of the newer generation, as well as cards, come in a vairant with 2 or even four chips on them. Memory itself is split into blocks, blocks are further split into pages. Similar to SSD, mode of working is that the controller determines the algorithm of data storage into chip/chips. Even though there are many manufacturers, with the exception of SanDisk and a few more, they all use standard mass produced controllers, different generations and revisions. Of course, for every manufacturer, algorithm for data storing is modified accordingly. One of the main disadvantages of these devices is the limited number of write and erase cycles before they fail. Depending on the technology of the memory chips themselves, that is are they SLC, MLC, TLC or xLC (number of bytes that can be stored in one cell), that number is from 3000-5000, going up to 100 thousand. In theory, USB flash can last for a few hundred years, if sparsely used. In practice, their lifetime is around a few years, although there are some that didn’t last a few months. 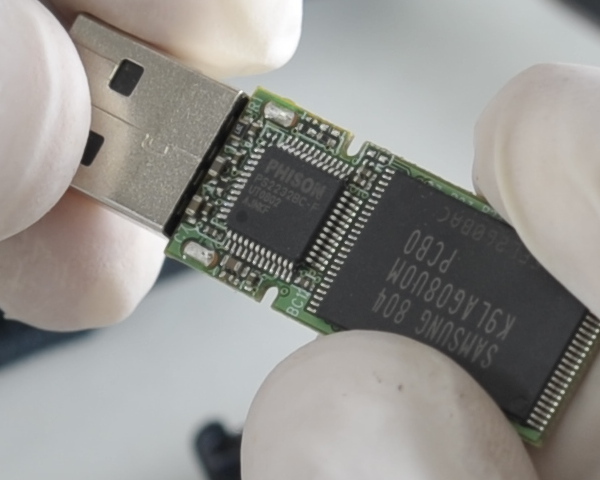 Data recovery from USB flash can be done in three ways, depending on the type of the malfunction. First and easier is a logic malfunction or eventual memory chip corruption, when a copy of a memory can be done, and afterwards file structure reconstruction. Second, in case of a mechanical or electronic malfunction to find a problem and fix it, again, gaining memory access and copying the data. And the third one, significantly longer and more expensive, is to unsoldier every chip on the flash, read the dumps, and go into reconstruction. That process takes more time, around 3 to 5 days, is extremely complicated and demanding. That makes it the most expensive.